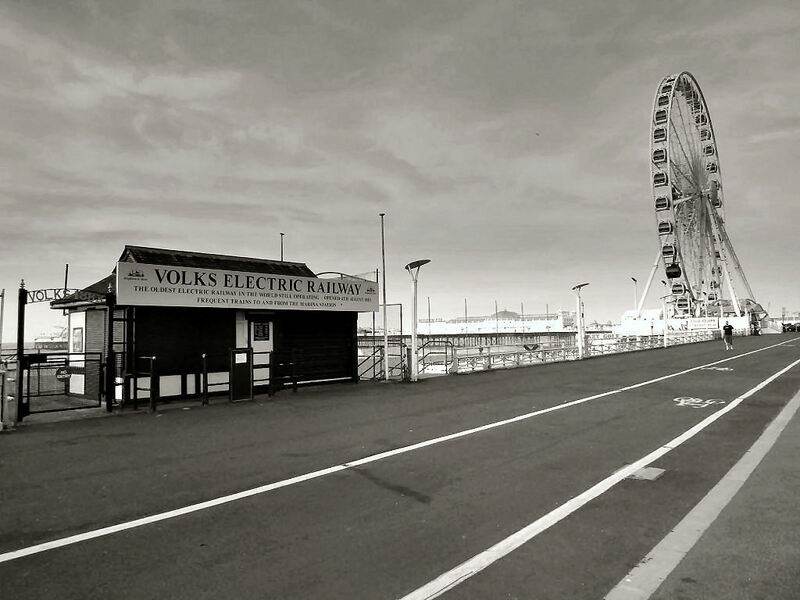 This photograph illustrates an interesting juxtaposition of two examples of seafront entertainment in Brighton – the old and the new. Click on the photograph to open a large version in a new window then click again for full screen. Brighton is a tourist destination; anyone who thinks the big wheel should have not been erected only has to look at this photo. The two older tourist entertainments in the photo have drawn people to Brighton for well over 100 years and have become iconic of Brighton. The Brighton Wheel may only be here for the five years of its lease, but it seems to sit well with the older seafront entertainments. The big conferences seem to have bypassed Brighton lately, so relying on traditional entertainment for visitors is a way to attract business to a seaside city. Great pic, which puts into perspective a century of seaside history as it also includes the 1891-built, 1986-modernised Palace Pier. Ain’t no standing still for progress. Interestingly the Wheel appears to stand pretty well half way between the current terminus of Volks’s line and its original terminus before it was cut back in 1930.